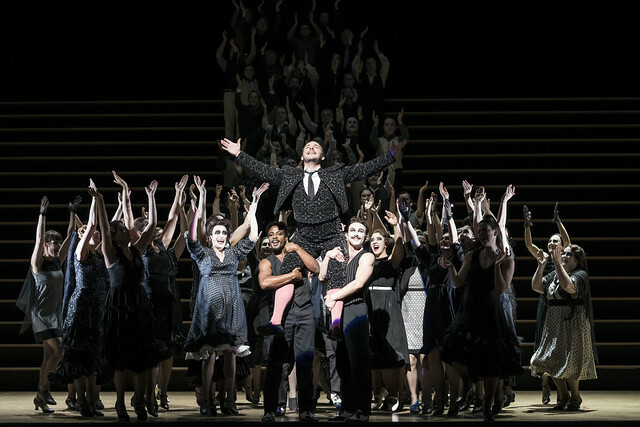 With a huge amount of stage time and some hefty vocal numbers, performing in the Chorus in Bizet's Carmen is tough work for even the most experienced choristers. In The Royal Opera's new production, Director Barrie Kosky has added further challenges for the singers: the 60 members of The Royal Opera Chorus are required to run up and down a huge set of moving stairs as they sing, dance and act. 'It's very difficult to do the kind of singing we do with that much choreography,' soprano Emma Smith explained, in an interview first broadcast as part of the cinema broadcast of Carmen. Kosky shared the rationale behind his unexpected staging and choreography: 'I don't like choruses to be treated as anonymous, all the same costume, all doing the same movement - that's boring, and they find it boring,' he said. Carmen runs until 16 March. Tickets are now sold out, but returns may become available. And staged with generous philanthropic support from Mrs Aline Foriel-Destezet, Yvonne and Bjarne Rieber, Alan Howard, Trifon and Despina Natsis, The ROH Young Philanthropists, and the Friends of Covent Garden. I am so glad that the chorus enjoyed themselves. This production was really quite difficult and distressing to watch so perhaps the director should put himself in the position of a member of the audience once in a while. I shall never understand the gorilla suit.I would not willingly see a repeat performance. Saw last night's performance (12 March) at cinema in Swansea. The constantly moving chorus, bizarrely painted, was amusing, like a group of children playing. The certainly seemed to enjoy themselves. Found the costumes drab, the stage set uninspiring, the constantly swishing skirts and touching themselves of the gypsy women to imply sexuality, unconvincing. The dancing was interesting but inappropriate. The singers playing Carmen and Micaela were superb both vocally and in acting ability and the orchestra performed exceptionally well. Liked the French narrator because I enjoy hearing French so beautifully spoken. Overall not the best production but an interesting one that I would go to again. Disappointed to the point that I left the Opera after Act I. This is for the first time in years of attending the ROH. All the above comments define this disastrous production. I will take this opportunity to ask for Pappano's resignation and thank him for all the wondergul performances and TV shows and the years of careful and vividly entertaining moments I will never forget. Unfortunately in business we are only as good as our last deal. I am not angry with Kosky, I just do not think he has what it takes. I am simply appalled that Antonio ever allowed this production to slight the outstanding record of his tenure. There are no excuses and no apologies needed, he should just go. I know there are always gripers and complainers, people who could not cope with blood dripping from Salome's severed head, those who did not like this or that or even a bit of the other. I am not one of them. What I will not tolerate is a production which was less interesting than some school or college events. My biggest concern is who should replace him. He may have made a sloppy and frankly unforgivable mistake, yet his remain big boots to fill. Furthermore, Antonio may want to consider well, the outstandingly poor reviews both us the clients and the newspaper critics offered, for his faux pas. What kind of effect it may have if his appearances as conductor was accompanied by a "Boo" or even several,"Boos" instead of the rapturous applause he is used to? For myself and most of those who attend, our time spent at the ROH is our 'Paradisum', we do not, I fear, take kindly to disappointment. ROH is bigger than Pappano. This is the mistake Antonio made here and this is the mistake which needs fully addressing. Soiling our stage with this production was not after all, quite so clever as he may have once thought. I suspect it may be a deliberate act to punish us the audience, punish the Board of Directors, or even a kind of "You are nothing without me" statement in the wake of Brexit. After Daniel B hijacking the proms, anything goes and nobody knows. We can presume that Antonio is too intelligent for this slight, not to bear some underlying message, even so, it is a great big 'no thanks' from everybody who has responded. It cannot happen again. I totally agree with the above comments! I too was appalled and disappointed and left the cinema after half an hour. I am thankful I only wasted twenty pounds and not hundreds at a Iive performance! I wouldn't book it for third time to see Carman!!!!! Music I have seen twice before but not like that new production!!! It's sink and down in the drain. I would not give support the opera. I will support the ballet!!!!! Saw it two times now, got all our friends to go and see it live in the opera. Unfortunately, was extremely hard to get tickets, as other got wind of this being the best production the opera saw in the last years! Truly superb, fantastic! Makes the audience think...finally! This is why this comments section is so great - no-one, least of all the ROH I expect, wants anyone to be disappointed. Thanks to one or two comments here those who desperately need their Carmen to be set in a tobacco factory and wearing mantillas can safely leave the field (and seats) clear for us Kosky fans. Roll on Friday night. Saw the cinema. Resinous earlier in the year with my daughter who had never before seen an opera. She was so excited, (over 50 by the way) as soon as tickets became available in July I booked. Saw it 'live' on Tuesday and it blew us both away. Magnificent theatre, the chorus were stars. I've seen traditional performances. None compare to Koskys great entertainment. Magnificent.